How do I catproof my garden? How do I cat-proof my garden? There are several options for cat-proofing your garden to keep your cat in and other cats out. Cats instinctively like to roam, but the modern world can be fraught with dangers, especially for those who live next to busy roads. 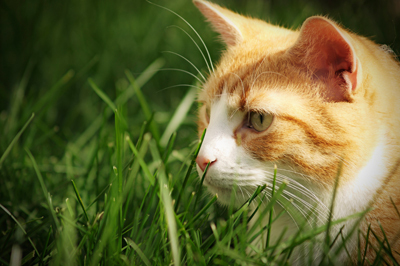 An answer to the dilemma of how to keep your cat safe outdoors is to enclose your garden. If you can secure your garden then you'll have the reassurance of knowing that your cat has the opportunity to enjoy being outside to explore, sunbathe and play, while being in a safe and contained environment. It should also prevent other cats from coming into your garden, which can be a source of stress for many cats. How you approach fencing in your garden and how to go about it will vary according to your own particular outdoor space and restrictions caused by fences or hedges currently in situ, buildings, neighbours and of course how all of these things lend themselves to being enclosed. There are several options available on the market today, including inward-curling, semi-flexible fencing that cats don't like to climb on. Any rigid upright fencing must have this inward facing overhang to prevent a cat from climbing out over the top. If you do choose to cat proof your garden with fencing, remember that you are limiting your cats' access and therefore you need to work harder to ensure that the garden contains plenty to keep him entertained, with places to sunbathe, climb, perch high up, hide and play. Don't forget to provide him with a private latrine area that'll be accessible for you to clean on a regular basis. You'll also need to be careful about the plants you have in your garden as a bored cat could start to nibble something that he might otherwise ignore. Instead, chose plants that he will find appealing, catnip being the obvious. Click here to read about the plants you should avoid with cats. Slug bait can be lethal, so use pet safe slug pellets or home-made beer traps. In this new series, we’ll follow James every step of the way as he transforms his ordinary garden into a safe and enriching sanctuary for his Ragdoll, Binx.